Our luxury villa is situated in 90° facing south directly at the Caloosa River. On 350 m2 of living area, there are 4 luxury bedrooms, some with water beds, bidets, Jacuzzi and 3.5 bathrooms. It is uniquely decorated. The house has a huge pool, cage and a boathouse for grilling. A 1200 m2 large palm and citrus garden surrounds the villa. It is quiet, yet close to the town - the dream of every holiday maker! But the highlight is certainly the 24 ft. motor yacht Sea Ray Sundancer 240, like new, well maintained by our Captain Martin, waiting for you on the boat lift free of cost. On request we can also provide another gem of ours, a 24 ft. sundeck boat from the brand 'Four Winns Horizon 240', available at your disposal for your boat tours. Special features: There is a German service and management on site. Hand towels, bath towels and bedding are inclusive. Extensive beach equipment - chairs, umbrellas, sun beds - makes your trips to nearby beaches very comfortable. For sporting activities there is an assortment of well-maintained mountain bikes. 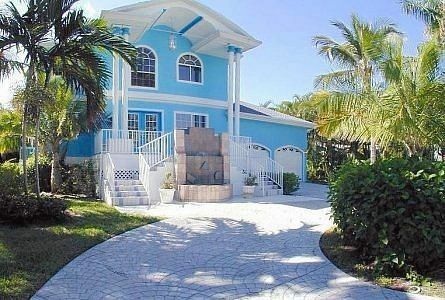 Our luxury villa is located on the idyllic peninsula of Cape Coral directly at Ft. Myers on the Gulf of Mexico. The city of Cape Coral is also called the Venice of America because of its many canals. A mild sunny climate prevails in this golf and swimming paradise. The airport in Ft. Myers is only 20 minutes away.